Who likes salty crunchy foods (frantically waving hands high over here)?! And any of you not able to eat nuts, don’t want all the typically added junk or just craving a cleaner cracker? 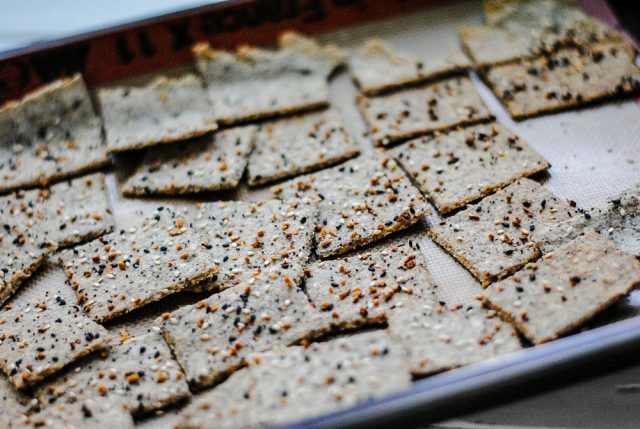 Then you’ve come to the right place, my friends, because I have a new recipe that I’m super totally stoked about: Nut-free paleo crackers. Let’s take a look! If you would’ve asked me some time ago if I would’ve thought I’d be making my own crackers, I’d say you were nuts (pardon the pun). 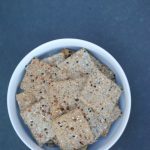 Back in the day (years and years ago when I could eat gluten), I was a Wheat-Thin addict. Seriously. I’ve also had a serious relationship (shhh) with pretzels, regular and gluten-free. 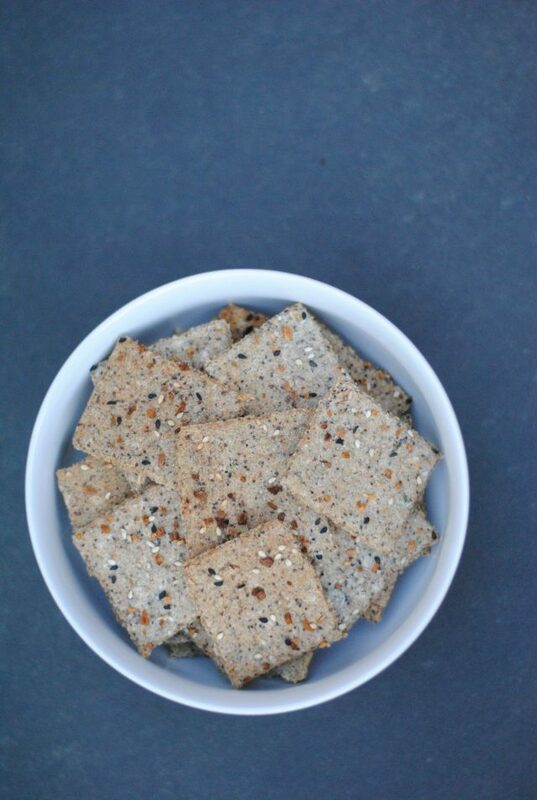 And I have been known to love me some Simple Mills Seed Crackers as of recent. But while I totally appreciate their products, they tend to get expensive and you know, I kinda like to eat them – a lot (sheepish grin). Which is not great on the pocketbook. So I wanted to make my own. And damn – the end result is goooood, if I do say so myself. The bonus? They’re simple to make. Versatile – change up the seasonings and make them your own! 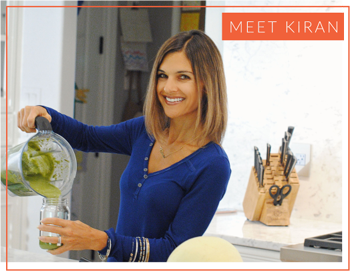 A high-speed blender helps break down the seeds into a more flour-y consistency so that they don’t taste so seedy. While I haven’t tried it, I’m guessing that a food processor would work as well. Silpat non-stick baking sheets help ensure that the crackers cook evenly without fear of sticking. Make sure to mix the cracker “dough” with a spatula for best results. Cassava flour is gluten and grain-free and a great alternative in this type of baking! I topped mine with Trader Joe’s Everything But the Bagel Seasoning Blend and they were deeeelish. If you don’t have a TJ’s near you, click the link I just shared to buy or try adding 1/2 tsp onion flakes or powder and 1/2 tsp garlic powder. Or whatever seasonings strike your fancy! Top your dough with wax paper to avoid sticking on the rolling pin. ***I noted it in the recipe, but you’ll want to let your dough chill in the fridge for 30 minutes before rolling it. This helps avoid stickiness. 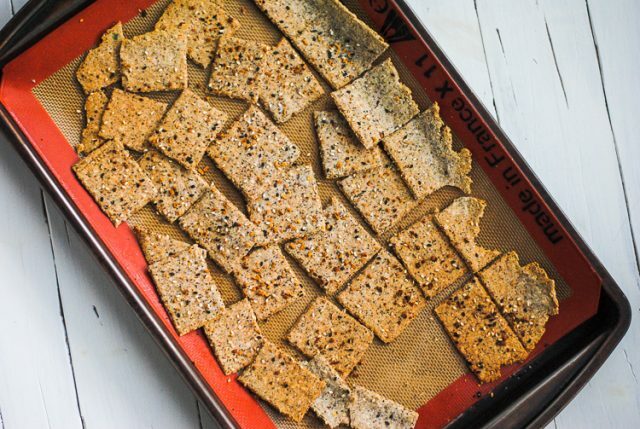 Delightlfully crunchy and tasty nut-free paleo crackers are perfect for dipping, snacking and on-the-go. Preheat oven to 350 degrees F. Line a baking sheet (or two) with a Silpat. In a high-speed blender (a food processor will likely also work), grind the sunflower, pumpkin, flax and chia seeds together (30 seconds). Dump the ground seeds into a medium-sized bowl, and add the cassava and tapioca flours as well as the salt. Mix to combine. Add the water and mix together with a spatula. Dough will be thick. IMPORTANT: Put dough in refrigerator for 30 minutes before removing to roll out. Place chilled dough on the prepared baking sheet (on top of Silpat) and place a piece of wax paper on top of the dough. Roll with a rolling pin until dough is the thickness of a cracker. Remove wax paper, and sprinkle seasoning on top. Very gently press seasoning into cracker dough. Cut with a pizza cutter into cracker shapes before placing in preheated oven for 45 minutes. Check crackers around the 40 minute mark to ensure they are not browning too much. Let cool and enjoy! I like using a pizza cutter to make square shapes, but I’m sure that other cookie cutters would work well, too. You could even use the top of a round glass if you wanted circular nut free paleo crackers. What would you serve these goodies with? Yes! My kids devoured them, too:). That Everything Seasoning is one of my favorite things ever! 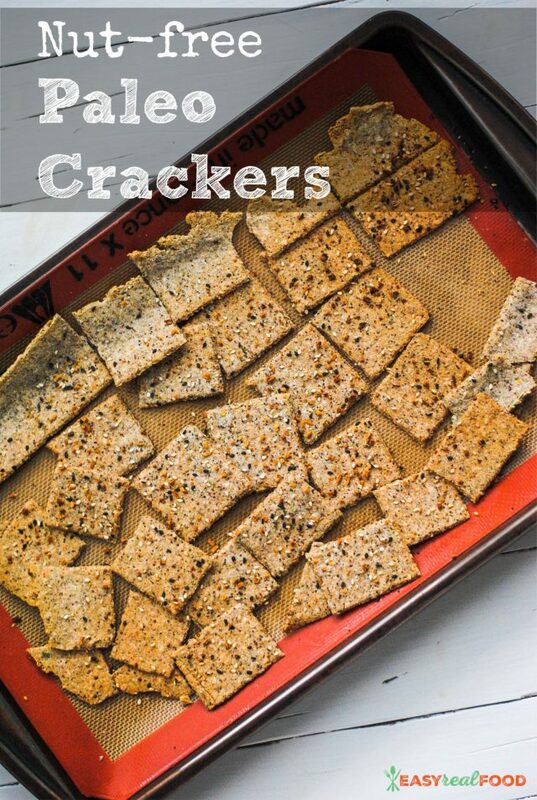 I want these crackers to dip in my new Everything Seasoning Dip! LOL! It is my favorite, too! And yes – sounds like a winning combo!